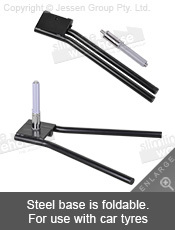 Setting up the display requires no tools, using the collapsible fibreglass pole for set-up! This tear drop flag, like a portable banner stand or custom teardrop banner, has two printing options available depending on your needs. Both are digitally printed onto woven polyester fabric for a hard-wearing flag that show a true depiction of designs in vivid full colour. 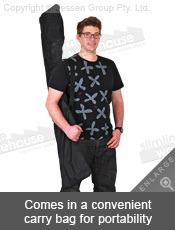 The single-sided version has a fibreglass pole included, with a reverse print on the back. The dual-sided blade banner features two flags sewn together, with a heavy duty metal pole that easily supports the extra weight. 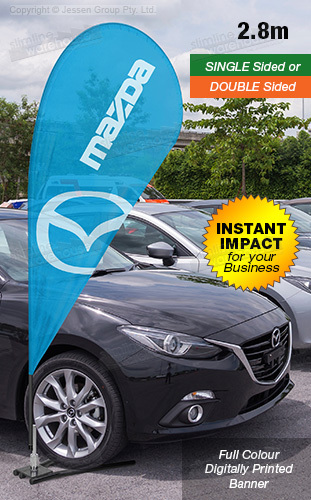 This tear drop flag is great for retail stores, restaurants, cafes, car dealerships, and outdoor events, where the 2.8m height is easily seen. 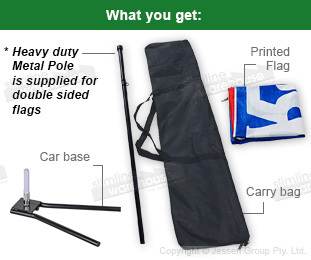 These custom blade flags are totally portable, with all components fitting into the nylon carrying bag for easy transport. This bag can also be used to store the flags between uses to keep them from getting dirty. Assembly takes only a few minutes with no tools requires, making this portable teardrop banner an easy purchase for any business! Browse through the extensive online catalogue to see all the different products that we offer to help you get ahead of the competition with the latest in technologies, trends, & styles at your disposal. With over 25 years experience in the business, Slimline Warehouse has become a national leader with a large customer base who constantly return to see our updated product listings! Despatch from our warehouse is available to anywhere in Australia, including Adelaide, Sydney, Hobart, Melbourne, Cairns, Brisbane, Gold Coast, Perth, Townsville, Wollongong, & Newcastle! 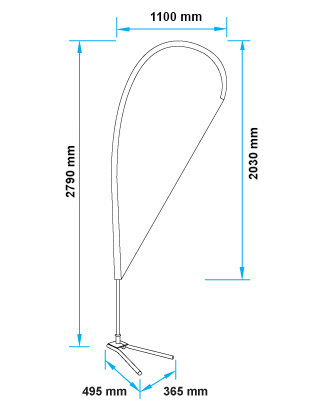 Pole: Fibreglass for single sided, metal pole for double sided.